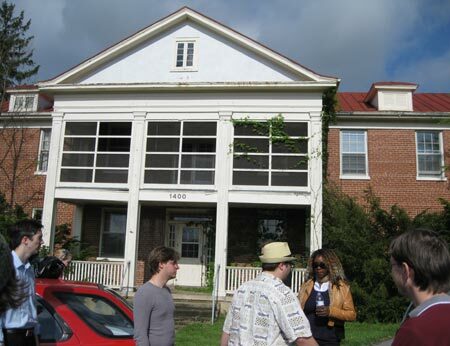 On location at our "mental hospital" in Waynesboro, Virginia. Mental hospitals are a favorite staple of the strange and the weird, so it’s de rigueur that spent today shooting in one — or at least in a building dressed up as one. Director John Johnson again demonstrated his impeccable connections in securing locations by taking us to an abandoned old folk’s home in nearby Waynesboro, Virginia. The place was falling apart and probably gave us asbestos poisoning just walking into it. It reminded me very much of the old DeJarnette Center here in Staunton. In typical movie world fashion, today we continued to film the story out of order, tackling the final scenes. John assembled the largest cast we’ve had so far: it included folks such as Donnie Sturges, who trekked all the way up from Hampton. I brought along my friend Megan Hefner, who donned a pink bathrobe to play a mental patient napping away upon a Monopoly game. I even came on as an extra for the second time so far, sitting across the table from Megan. It was great to get up this morning; I didn’t even have to change out of my jammies or comb out my bed head. John climbed onto the roof for one shot of the main character walking across the parking lot. Tomorrow, we head to Roanoke to film several evening scenes in a Chinese restaurant. It promises to be another long night, but the time passes quickly.